Manufactured from mild steel, the Junior Peterson (JP) is the perfect swingblade sawmill designed for part time sawmilling. Ideal for customers who are wanting to cut their own lumber for home and farm projects, the Junior Peterson Portable Sawmill is competitively priced, solid in structure, productive and portable. 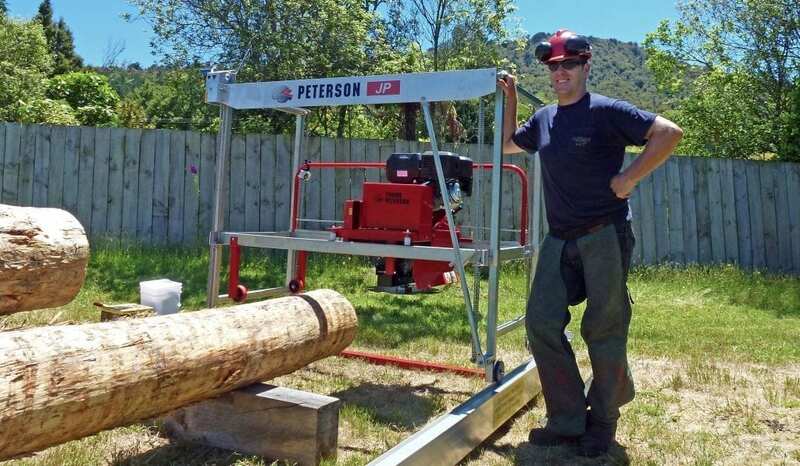 It is a small sawmill compared to others in Peterson’s range, and the ‘ease of use’ design means that even if you haven’t operated a sawmill before, you will soon gain confidence operating the Junior Peterson. With many of the features of the larger Peterson models, the Junior Peterson is a great option for those seeking a lower price point. 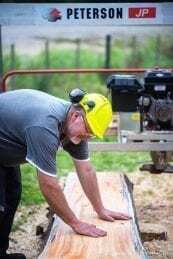 This small sawmill is lightweight, can be transported on the deck of a pick up or on a trailer, is simple for one person to use and the JP produces top quality dimensional lumber straight off the mill. You can also cut weather boards/tapered siding without the need to purchase an extra attachment! On all ASM and WPF and JP frames, the system allows the operator to lower all four corners of the mill equally from one position meaning more accurate boards. The manual, single point winch system, may be upgraded to electric on the WPF. The Peterson JP, WPF, ASM and DWS have all been designed with a track system which allows for unlimited track extensions (extensions available as optional extras). Perfect for a job like when Jeff Sincell milled a 40′ log on his WPF. Peterson sawblades last for 2-6 years with normal use and maintenance. However, some sawmill owners have been using the same blades for over 10 years! With our blades, maintenance is minimal as our circular blades can be sharpened right on the mill in less than five minutes. Peterson’s left/right sizing system is run by chain and sprocket, with a turning handle and lock. So that means it will only move when you unlock it, and you can position the sizing very accurately to within 1mm. No slippage, and top accuracy for every board. To decrease downtime, the Peterson blade can be sharpened while it is still on the sawmill; in less than 10 minutes, and without having to remove any guards. For your convenience the sharpener you receive with your mill purchase is pre-set to fit your blade size. Petersons mount our sawmill engines higher than other manufacturers for two reasons: firstly, to ensure the air filter intake is further away from the sawdust output. This prevents sawdust build up and overheating of the motor. And secondly, to allow the ability of double-cutting to full depth, without the motor and gearbox restricting the opposite side of the blade. 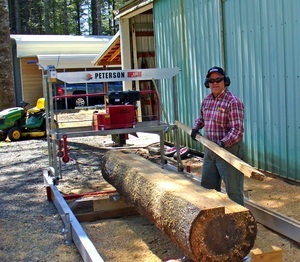 Use the Junior Peterson Portable Sawmill to produce one full width slab from every log you cut! Simply measure the desired depth of slab that you want to get from the middle of your log, mill down to your start point then turn the log over 180º. Your log will automatically be level to the bottom of your slab. Now you just need to sawmill dimensional lumber from the top of the log until you create the flat face of the top of your slab! 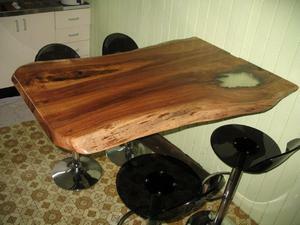 Get the elbow grease out for sanding, apply some lacquer and you have yourself a stunning table top, bench top or bar leaner.